Gov. 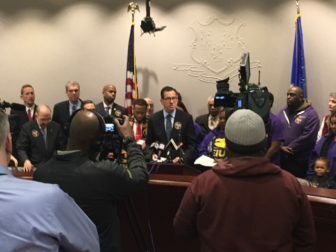 Dannel P. Malloy and a bipartisan group of state lawmakers voice their support for a proposed contract for 8,500 home care workers. A bipartisan coalition of Connecticut lawmakers and the governor voiced support Tuesday for a proposed contract that will raise wages, provide workers’ compensation and increase training programs for about 8,500 home-care workers. The House and Senate are scheduled to vote on the contract Wednesday, which would increase wages to $16.25 per hour by 2020. Most home care workers earn $13.53 per hour, according to SEIU 1199 New England, the union that represents the home care workers. The proposed contract is retroactive, effective Jan. 1, 2016 to June 30, 2021. The workers care for elderly and disabled state residents in their homes, including helping them with dressing, bathing, personal hygiene, cooking, grocery shopping and transportation. They are funded through the state departments of Social Services and Developmental Services under programs such as Medicaid. A law enacted in 2012 allowed unions representing daycare providers and home care workers paid through public programs to negotiate with the state. The first home care workers contract was approved in 2014. Under the agreement, beginning April 1, the hourly rate would increase to $14.75. Beginning July 1, the rate increases to $15 per hour. After July 1, that rate would increase by $0.25 per hour every six months until the rate hits $16.25 per hour in July 2020. Employees currently over $15 per hour would be guaranteed 1.5 percent general wage increases per year. The total cost to the state, after factoring in Medicaid reimbursement, is $725,790 in fiscal year 2018; $7 million in 2019; $9.4 million in 2020; and $11.4 million in 2021. Denitra Pearson, 37, of New Haven, has been a home care worker for more than 20 years. Pearson, a mother of five, now makes $13.43 per hour. “It makes me feel great that I can do all the things for my clients that we take for granted, but people with disabilities may not be able to do themselves,” said Pearson at the press conference. “However, there are a lot of problems in this field. I take care of the safety of another person, but without workers’ compensation, I stress every day about my own safety and my own security if I got hurt. “This contract will allow me to stop making tough choices, like paying rent or buying groceries,” she said. Jennifer Klein, a Yale University professor, said home care is one of the fastest-growing occupations in the nation because of the aging population and the fact that these jobs can’t be offshored. Others who spoke in support of the proposed contract at Tuesday’s press conference included Senate President Pro Tem Martin M. Looney, D-New Haven; Senate Majority Leader Bob Duff, D-Norwalk; Senate Minority Leader Len Fasano, R-North Haven; and Rep. Mike D’Agostino, D-Hamden, who is exploring a run for attorney general. Pat O’Neil, spokesman for House Minority Leader Themis Klarides, R-Derby, said in an email that House Republicans will caucus the issue at 9 a.m. Wednesday. “We will know what kind of support it has then,” O’Neil said. In a statement, House Speaker Joe Aresimowicz, D-Berlin, said he was confident the proposal would pass the House on Wednesday. “We are talking about low wage workers with the enormous responsibility of caring for our loved ones, who are also saving taxpayers millions of dollars by helping people stay in their homes,” he said.